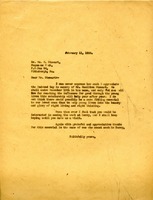 Letter to Wm. 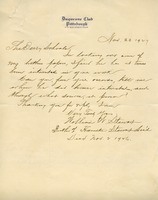 W. Stewart from Martha Berry informing him of her appreciation of the endowment he established in the name of Mr. Hamilton Stewart. She informs him she thinks this is one of the best ways of remembering our loved ones, by helping the lives of young people and teaching them the right way of living and thinking. She also hears that he is interested in seeing the work at the Berry Schools and hopes that he will visit the schools soon.